TORONTO, April 1, 2019 /CNW Telbec/ - As NIVEA Canada celebrates year one of their partnership with Canadian Ice Dancer and Olympic Gold Medallist, Tessa Virtue, they also celebrate year one of a refreshed Brand direction. Throughout 2018, NIVEA encouraged consumers to feel good in their skin. This overarching concept is rooted in feeling confident, empowered and determined to be the best version of yourself and this mindset is knowing there are no limits to what you can achieve. 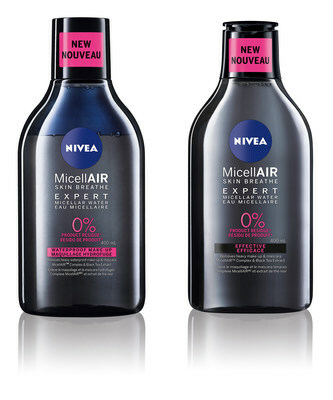 NIVEA continues to grow in this new direction with the launch of its latest product innovation, MicellAIR Expert and the release of the #NIVEANoLimits campaign. In this boundary-breaking video, NIVEA captures a stunning ice performance by Virtue, entitled NO LIMITS – an original piece choreographed by Sam Chouinard to a commissioned soundtrack entitled Fearless. The choreography tells the story of Tessa's journey of strength and growth which beautifully parallels Virtue's personal transformation from Olympic Athlete to Performance Artist. Tessa's masterfully created peacock costume is painted entirely of makeup, applied by Professional Makeup Artist Marika D'Auteuil and her team. The peacock is known to be fearless – displaying themselves brazenly by flashing their beautifully coloured feathers. The choice to transform Virtue in to a peacock was deliberate, to tell a story through choreography of breaking free, being fearless, and feeling confident in your skin. "The process of getting into character as part of the peacock storyline was both inspiring and enlightening. The initial vulnerability combined with the evolution of connecting with the movement, finding my space, and wanting to showcase my confidence was incredibly powerful," says Olympic Ice Dancer Tessa Virtue. "I love the notion of embracing one's true colours - unapologetically owning who you are and finding fulfillment in expressing yourself authentically to the world. The performance element of this campaign is what sets Nivea apart ... the brand is willing to take risks in its relentless pursuit of excellence, all the while encouraging others to feel good in their skin. We can all learn from that messaging!" "This innovative performance video and empowering "feel good in your skin" message showcases how NIVEA is connecting with consumers on a much deeper level to inspire confidence, strength and determination among fans of the brand. We couldn't be more thrilled with Tessa's stunning execution of this concept," says NIVEA Marketing Director, Julia Geissen.